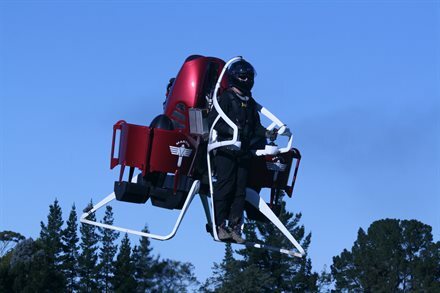 New Zealand’s Martin Aircraft is developing the “first practical jetpack” and has done manned and unmanned flight tests of its latest prototype, Aviation Week reports. When completed it will be aimed at first responders (such as fire services), planned to be available in 2014. You will have to wait a bit longer for a personal JetPack. Flight control is fly-by-wire (computer-controlled) and there’s a recovery parachute, linked to the engine so it deploys automatically if it malfunctions. The undercarriage and frame is impact-absorbing and there is a flotation device in case of a ditching. Martin is aiming for a maximum speed of 46 mph, 30km range, and 30 minutes endurance. There is also interest from the military and for uses ranging from border patrol and search-and-rescue to corporate events and “jetpack experience” thrill rides.